As the winter quarter winds down, students are beginning to look forward to what spring has to offer. This includes one of UCLA’s most popular events of the year, Spring Sing, which just released its lineup Friday. Spring Sing is an event that not only allows students to showcase their artistic talents in front of their peers, but also to potentially expose themselves to recording companies or other higher powers. However, another perk to attending the show is the opportunity to be in the presence of a few celebrities. Last year’s show, for example, had special appearances by both Raven Symoné and Alanis Morissette. 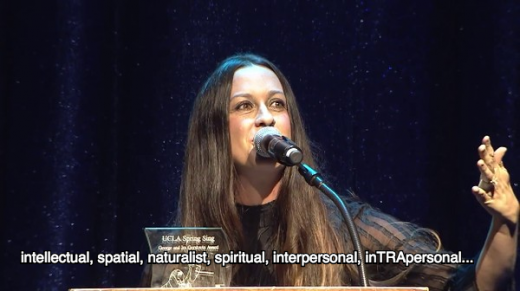 Don’t get me wrong, Raven was fantastic, but who could forget that awe-inspiring speech made by the unofficial queen of 90′s alternative rock? 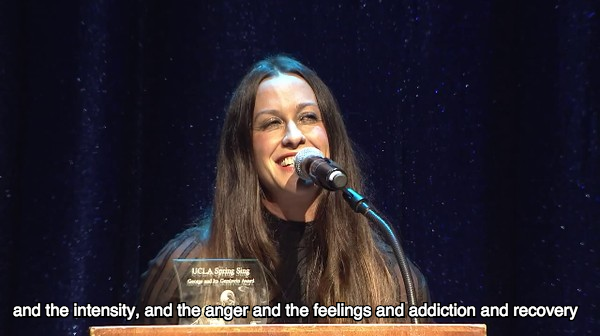 In honor of the release of the lineup for Spring Sing 2015, Mojo takes a look back at an acceptance speech to remember. 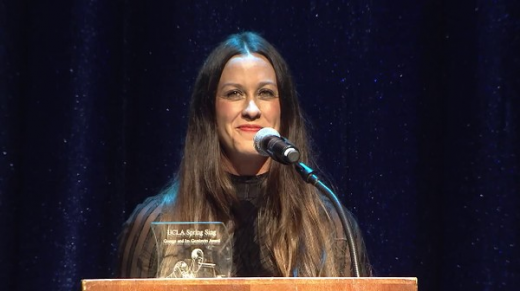 Morissette was honored with the George and Ira Gershwin Award for Lifetime Musical Achievement during Spring Sing last year, prompting her to make a lengthy speech about the importance of, well, we’re still not quite sure. 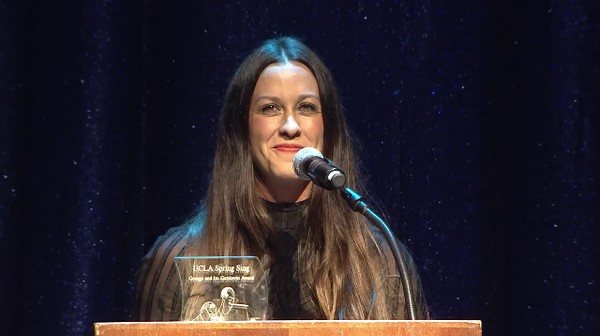 She started off strong, first giving a few shout-outs to UCLA. 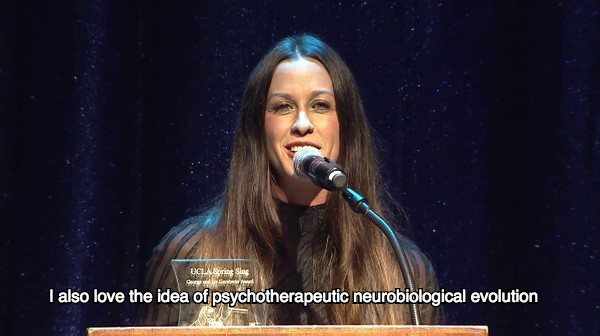 And then, she bust out the big guns: PSYCHOTHERAPEUTIC NEUROBIOLOGICAL EVOLUTION. Thanks, Alanis. 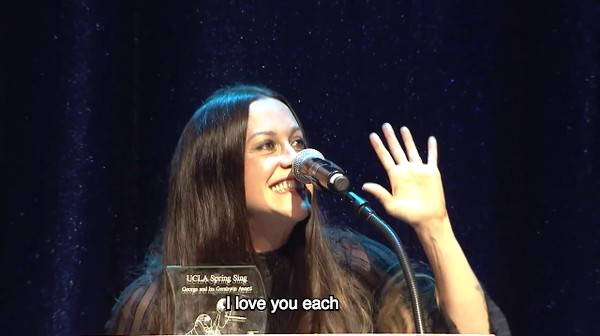 We love you too. You can find the Spring Sing 2015 lineup here. As you might already know, Chinese New Year, otherwise known as the Lunar New Year, is on Thursday, Feb. 19. The holiday is an opportunity to usher in prosperity, good fortune, good health and happiness with the coming new year. For those of you who want to ring in the “Year of the Ram” with friends, there are a few places to celebrate, both on campus and in the greater Los Angeles area. From traditional food to firecrackers – and everything in between – here are a few events to check out within the next week. What: Feast is planning a themed menu especially for this holiday. Enjoy traditional Chinese cuisine with special features including an appearance by ACA’s Chinese Lion Dance troupe. What: Come see a selection of 22 Chinese New Year paintings on display for a limited time only that have been donated by the Shanghai Library, a partner of the UCLA Library. When: Feb. 4 at 8 a.m. to March 4 at 11 p.m.
What: Come on down for the 115th annual Chinese New Year parade and festival in downtown Chinatown that includes entertainment such as kung fu exhibitions, food trucks, pingpong, traditional Chinese paper folding, face painting and more. This event is free and open to all! When: Feb. 21 at 1 p.m.